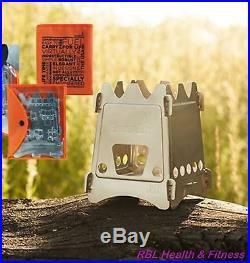 EmberLit-UL Ultra-Lite Titanium Camp Stove with Cross Bars and Plastic Storage Sleeve printed with assembly instructions new in its original packaging. The Most Convenient, Easy-To-Carry Wood Stove on the Planet. The patented EmberLit-UL Titanium Camp Stove is a lightweight, compact, wood burning stove that doesn’t require you to carry any fuel. It packs completely flat to about 1/8th in. Thick, weighs only 5.45 oz, and is 100% made in the USA from titanium. The EmberLit Stove is designed to use debris and scrap wood, which are always free and abundant. This is especially useful during prolonged utility outages after natural or social disasters. Cook your food and sanitize your water using just a handful of sticks. The EmberLit Stove takes up minimal space and weighs so little it can easily fit into bug out bags, 72-hour kits, and just about anywhere. Quick, Easy, and Dependable. What sets this stove apart from others is its ease of use. Properly fed, the EmberLit Stove requires minimal effort to produce and maintains an even flame with little or no smoke. This means that instead of fidgeting with the stove you can focus on cooking. Since the EmberLit makes much more efficient use of fuel than an open camp fire, a couple of handfuls of twigs and sticks gathered on the trail is more than enough to boil water and cook a full meal. With a little practice, the EmberLit can free you from the burden of carrying fuel and fuel canisters. However the EmberLit will also work as a windscreen for esbit tablets, trioxane fuel, alcohol stoves, storm candles, chafing dish heaters, and so on. Enjoying a hot meal to the soft, warm glow of the Emberlit stove will enhance any wilderness experience. 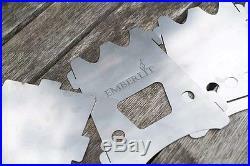 What Makes EmerberLit’s UL Titanium Stove the BEST. Easy to Use – Assembles in seconds. Free Fuel – Just a handful of sticks on the trail is enough to cook a full meal. Unique Feed Port – Holds fuel wood in place just above the embers. Efficient Burning – Creates a strong draft of oxygen-rich air to ensure plenty of air flow; solid burn plate collects embers that protect & focus enough heat to burn thick fuel. Sturdy – Tough enough to support a Dutch oven or cast iron skillet. Compact – Less than 6 oz. Stores flat & packs down to approx. You’ll hardly know it’s there! Plastic storage sleeve printed with assembly instructions ensures easy transport/assembly. Made in the USA. Weight: 5.45oz (136 g). Panels: 4.5″ x 5″. Top of Stove: 3.5″x3.5″. Storage: Packs flat to 1/8th of an inch. Fuel: Does not require you to carry any fuel. Includes: Cross Bars, Plastic Storage Sleeve with printed assembly instructions. Care, Assembly & Use. Check out these great instructional videos to learn about the care, assembly, and use of your EmberLit stove. Thank you for looking!! 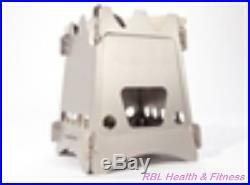 The item “EmberLit UL UltraLight TITANIUM Camp Survival Stove with Storage Sleeve” is in sale since Saturday, November 15, 2014. This item is in the category “Sporting Goods\Outdoor Sports\Camping & Hiking\Camping Cooking Supplies\Camping Stoves, Ovens & BBQs\Camping Stoves”. 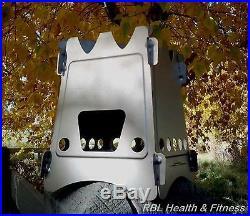 The seller is “rbl-health-and-fitness” and is located in Albuquerque, New Mexico. This item can be shipped to United States.